"Chicken Parm you taste so good..."
It's funny the places I draw my inspiration. I actually thought of this recipe during one of those Peyton Manning Nationwide commercials. Seemed like a natural combo. All of the ingredients of delicious Chicken Parm (chicken, breadcrumbs, Parmesan, mozzarella, herbs, marinara sauce) wrapped up into one tasty meatball. I've actually made these twice this month and they were hits both times. The first was at my college girlfriends' annual ornament exchange (which I got to attend for the first time in Seattle!) and the second was at a co-worker's Christmas party. I made a few tweaks and I am really happy with the finished product. 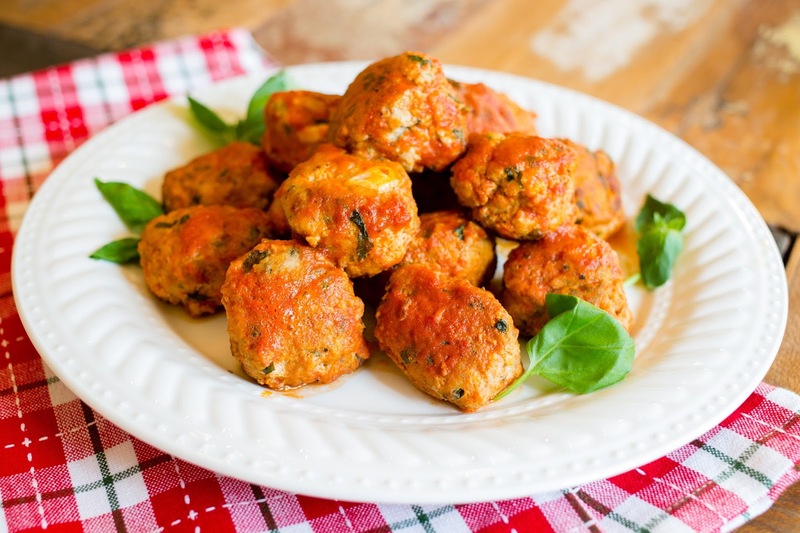 They are fabulous as a party appetizer but would also be amazing on a big plate of spaghetti or on a sub. Start with a pound of ground chicken thighs. I like thighs as opposed to breasts because, as with the full versions of each... the thighs are going to be more flavorful and less dry. (No one likes a dry meatball!) I added 1/2 cup of seasoned bread crumbs from the bakery section of the grocery store (better that the commercial versions because they won't have high fructose corn syrup or partially hydrogenated oils). If your bakery only carries regular bread crumbs, you can add a couple teaspoons of Italian seasoning. I also added 1/3 cup of grated Parmesan, 1/3 cup chopped basil, 2 eggs and salt & pepper. (I also felt the extra egg helped bind them together better the second time around). Lightly mix until just combined. 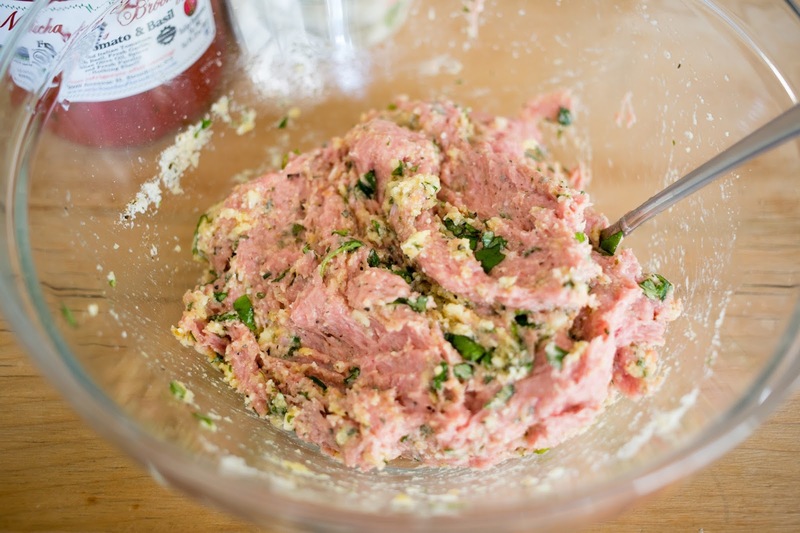 (Over mixing will produce a dense meatball). The best part about these meatballs is that they are each stuffed with fresh mozzarella. Mmmmm. What a cheesy, fun surprise. Look for the "pearl" mozzarella balls, which are smaller than the traditional bocconcini balls. If you can't find them, you can use the full sized ones... you will just need to make bigger meatballs, or slice the cheese in half. You should be able to get about 18 meatballs from this mixture. The first time I did this, I made larger meatballs (with two pearls per ball). They were still delicious but a little harder to manage as a party app. Instead, go with a smaller size... somewhere around the size of a ping pong ball or just slightly bigger. Form the meatballs first (it helps to coat your hands in olive oil), then go back and press a pearl mozzarella ball into the center, and close the meat back around it. Make sure none of the white is peaking through or the cheese will ooze out of your meatball during the cooking process. 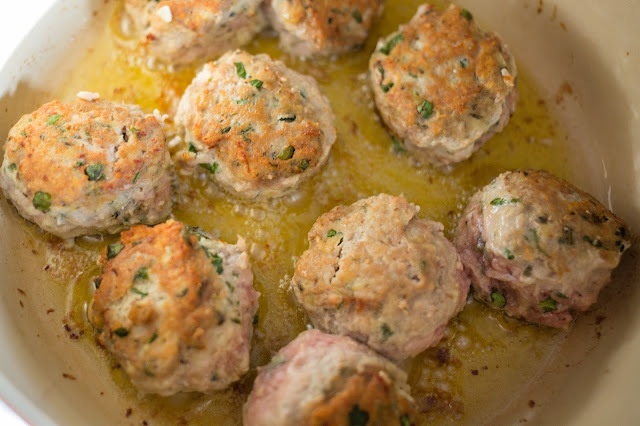 Some meatball aficionados will tell you that the meatballs should simply just cook in a simmering sauce without searing them first. Personally, I do enjoy a quick sear to give a nice little crust to them and hold the cheese and moisture inside. Depending on the size of your pot, you will likely need to do this in two batches. They don't need to be cooked through at this point, just lightly seared on the outside. Return all of the meatballs to the pot and add your sauce. I recommend a homemade easy marinara sauce such as this one. However, truth be told, I didn't have time to do that in either instance so I used a really good quality store bought sauce... so I give you permission to do that if you are pinched for time. Cover and simmer on low for about 30 minutes, or until meatballs are cooked through. 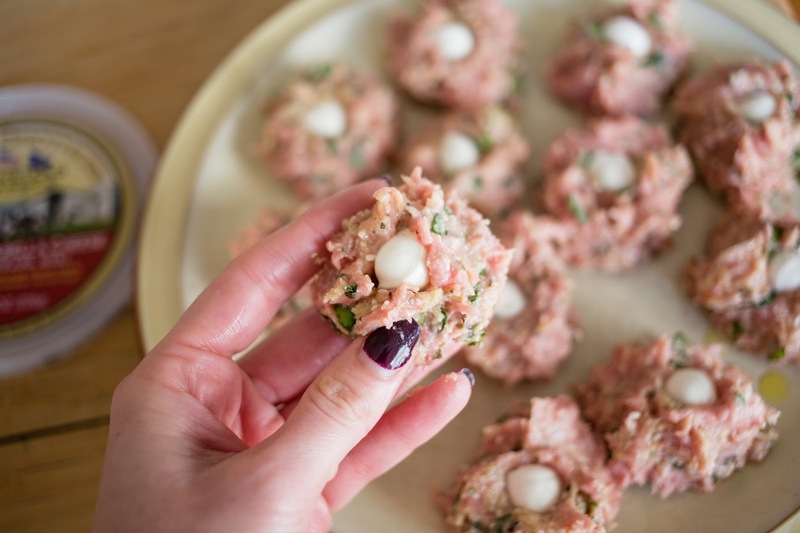 Form into 18 meatballs, roughly the size of ping pong balls. 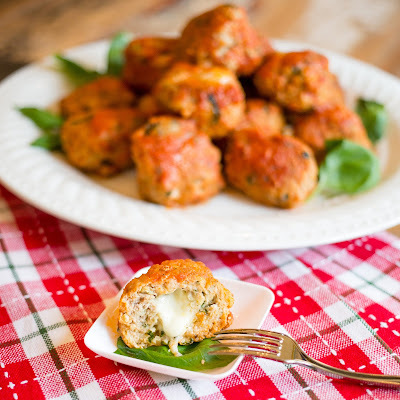 Press a small mozzarella ball into each, and enclose meat around the cheese ball so that no white is peaking through. Coat the bottom of a pot or dutch oven with olive oil and heat over medium. Working in batches, lightly sear the meatballs on all sides, adding more oil for the second batch if needed. 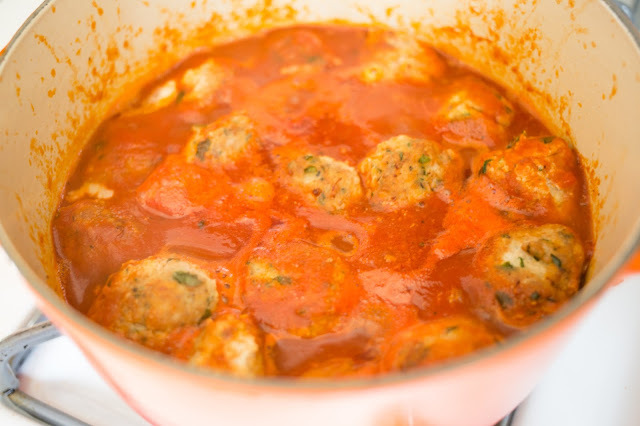 Return all meatballs to the pot and cover with marinara sauce. Cover and simmer for 30 minutes, or until meatballs are cooked through. Serve as appetizers or over pasta or on a sub sandwich. Curious as to whether you are grinding your own chicken, or having the butcher do it for you.... don't think any of the stores near me sell ground thighs, and I don't have the equipment to do it myself (someday though), so hopefully I would be able to talk the butcher at the store into doing it for me. I usually just ask my butcher to do it! Oh gosh, these look dangerously delicious! If these were served as appetizers, I don't think I'd have any room left for the main course! I'm looking forward to trying these. Relay nice recipe. That looks delicious. Love mustard and garlic, so I've sure I'd like the mustard aoili. The only word is yum! It looks so delicious, I need to invest a meat grinder at home, so that I can make this dish more often.Yummy!!!! OH my gosh these look amazing! Cannot wait to try it. Soooooo good! I need to make these again soon myself!